Wang Han should not be growing up in the countryside. Whether they like it or not, his parents were forced to relocate to Guizhou province as part of the Cultural Revolution’s Third Front campaign. For an active eleven year old boy, it is not such a bad environment. 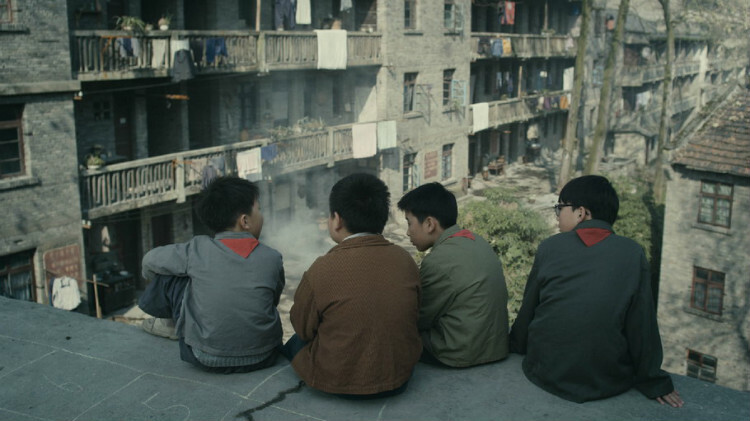 However, he has an unusual vantage point to observe the struggles of another “intellectual” family in Wang Xiaoshuai’s 11 Flowers (trailer here), which opens today in New York. Frankly, Wang Han’s father is fortunate to have a job with an out-of-town opera company, but it requires spending extensive time away from home. Each time he commutes to work, he accompanies Wang Han part of the way to school. It is an important ritual that cements their bond. Wang Han does not share a similar bond with his stern factory worker mother. When chosen to be the leader of his school’s morning calisthenics (part of their daily Maoist regimen), Wang Han’s principal rather insensitively tells the boy to ask for a new shirt for the occasion. Of course, this would be a considerable investment in money and cloth ration vouchers for the family. Nonetheless, his mother eventually relents. For a brief period, life is good for Wang Han, but the discovery of a dead body is an ill omen, as is the conspicuous distress experienced by Jue Hong, his frequently absent crush. While his family has largely avoided trouble, her “intellectual” father, Xie Fulai, has not. Nor has she. Evidently, the dead man raped the young girl, as her brother the killer explains to Wang Han, when circumstances bring them together in the forest. It is a frightening meeting for the eleven year old, made considerably worse when the fugitive forcibly takes his new shirt. It might be overstating matters to describe the semi-autobiographical 11 Flowers as the late Cultural Revolution era version of To Kill a Mockingbird, but it gives a general sense of what to expect from the coming of age story. Wang focuses on the personal, but the political periodically intrudes in rudely menacing ways. Through Wang Han’s eyes, the Cultural Revolution is not so much an exercise in ideological excess, but the periodic explosion of street thuggery, as when his father is caught in a Red Guard rampage. Liu Wenqing is a remarkably expressive young actor, who perfectly anchors the film. He makes Wang Han’s slow evolution from innocence to awakened conscience quite riveting and moving. Likewise, the young supporting cast-members are spot-on as his classmates. Yet, the subtle power of Wang Jingchun’s work as his father really sneaks up on audiences. When he encourages Wang Han’s painting as a means of artistic freedom, it feels light and natural at the time, but it is hugely significant in retrospect. 11 Flowers is unusually sensitive and accomplished. It is probably the best film to focus on a youthful cast since Tom Shu-yu Lin’s Starry Starry Night, which was probably the best since who knows what? Beautifully lensed by Dong Jinsong, it is quality cinema on every level. 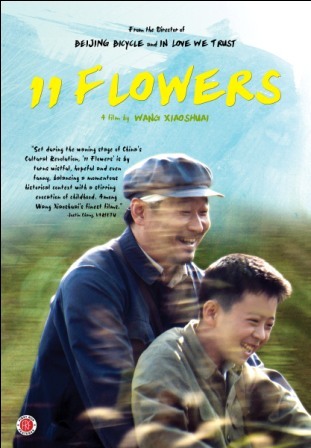 Highly recommended, 11 Flowers opens today (2/22) in New York at the Quad Cinema downtown and the Elinor Bunin Munroe Film Center uptown.